Category: Refractive / Corneal Therapies. Corneal cross-linking (CXL) is a treatment with the aim of strengthening the corneal stromal tissue. This is achieved by the creation of new chemical bonds between stromal ﬁbers. Until today, corneal cross-linking has been the only successful treatment to stop progressive keratoconus and related ectatic diseases such as pellucid marginal degeneration and iatrogenic ectasia. 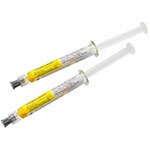 Since its introduction in 2006, tens of thousands of patients around the world have been successfully treated. In recent years, corneal cross-linking has become the standard procedure for treating patients with progressive keratoconus and other ectatic corneal diseases because of its effectiveness and lack of serious side effects. In a number of clinical studies it was demonstrated that in more than 85% of eyes treated, the BCVA increased signiﬁcantly. Six months after the procedure, cylinder was reduced in the majority of all patients. The steepest K-value was reduced by an average of up to 2 dioptres. Corneal cross-linking is a process of photopolymerisation. During this process of photopolymerisation, singlet oxygen is being created with the use of riboﬂavin as a photomediator activated by UV-light. Free radicals lead to physical intra- and interhelical cross-links of stromal collagen ﬁbers. This process takes place mainly in the anterior 150 μ of the stroma. This is important to remember in cases where a refractive procedure is planned post-CXL. 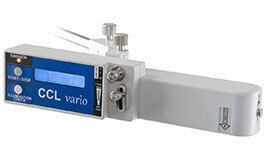 The CCL-VARIO corneal cross-linking system was designed with a special focus on effectiveness, safety and user friendliness. 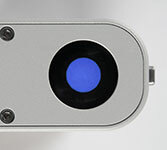 It comes with 1 diode and special optics which is homogenising the beam. Thus, hot spots are being avoided and the endothelium is sufﬁciently protected. To offer more ﬂexibility, it enables the surgeon to choose between 3 energy levels: 3 mW, 9 mW and 18 mW. This allows the surgeon to choose the ideal energy/time combination for the intended treatment: Standard – Accelerated – Express Cross-linking. At the end of the procedure the system switches off automatically. 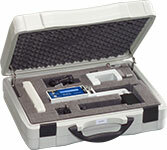 Since the total dose of radiation is time dependant, each setting delivers a total energy of 5,400 mJ. Studies performed by Prof. Eberhard Spoerl, PhD at the University of Dresden demonstrated that the amount of cross-links achieved by various energy levels is practically the same. To guarantee a high level of safety, the beam of CCL-VARIO has a wasteline at a distance of 45mm from the optics and a depth of focus of approximately +/- 5mm. To protect the limbal stem cells and to focus the beam on the clear cornea only the CCL-VARIO has a continuously adjustable aperture from 7 mm to 11 mm. 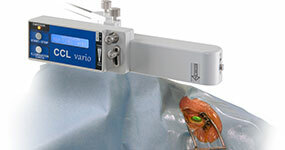 The CCL-VARIO is portable with a table mount and comes in a sturdy transport case allowing the surgeon to be mobile.